Large (140 square meters), full of light (see pics) flat with garden in the historical center of Lisbon, walking distance from all main tourist sites in the old town. The flat has large windows with unrestricted panoramic views of Lisbon and the castle and conserves all of its original features - high sculptured ceilings, original wood floors, etc. This, together with its secluded garden where you can seat by the end of the day with a glass of wine hearing nothing the birds and feeling anywhere but in the middle of a capital, makes this flat the perfect place to stay in Lisbon. This a ground floor, 8 steps above the garden with handrails on both sides of the steps to help climbing. The flat then is all on the same level. Suitable for people with mobility issues although not for wheelchair users only because of those steps. Graca (where we are) is an area with a bohemian but also very family-orientated atmosphere. Full of family restaurants and open doors cafes, as well as several public gardens and spaces for the kids to play outside. 10 min walk from Alfama , the castle of San Jorge and the famous flea market 'Feira da Ladra. 15 min walking distance from the National Pantheon of Santa Engracia and Lisboa's cathedral. ARRIVAL TIMES are flexible but , unless previously organised differently, are assumed to be between 8AM-6PM (office times). If you arrive at any other time please let us know before booking, we are always happy to help but we need to be sure there is someone to meet you at arrival. Arrivals after 11pm, we are really sorry but we can not accommodate as there is no one to receive guests. I am an academic in the UK, where I have now lived for a few decades. Besides the qualities of the property, we have been listed here since 1998 without any complaints and several positive reviews even if we really need to remember to ask for more. Furthermore, until 2014, all payments were done directly to the owners and we never had any problem. The flat has a garden, a rare luxury in the middle of the city, where you can seat by the end of the day with a glass of wine, have a BBQ or just lay on the grass. There are always birds singing in the morning making breakfast outside a great way to start the day (especially as the sun rises on the side of the garden ). We had a wonderful stay in Lisbon with our small children, the apartment is great - perfect location and in walking distance to many great sights, quiet with a small garden and a wonderful view. Thanks Catarina for your help! Lovely home in the middle of everything, cafes, restaurants, monuments, shops, cabs, without forgetting right by the tram 28. Lovely location. Catarina was very helpful in providing some useful information upfront in terms of the local area and where to eat etc. We liked the local flea market so much we went back twice (Saturdays and Tuesdays). Elegant historic scenic spacious and comfortable! We were absolutely thrilled with this apartment and it exceeded all of our expectations. We felt like we were staying in someone’s elegant beautiful Graca home, and in-fact we were. The view out the window of the Castelo de S. Jorge and the old neighborhoods of Graca and Alfama was like being transported back in time. Up the road to the right, we could see the Jardim da Graça, were we spent several sunsets and very late evenings drinking wine. We took our breakfasts in the garden, and spent our days exploring the local neighborhood of Graca. For us, it was a lucky call, but Graca is without question the best place to stay in Lisbon. Catarina and her support team we super helpful. It was just three of us, husband, wife, four-year-old, and the house was very spacious and could easily hold more. Parking on the street was easy. 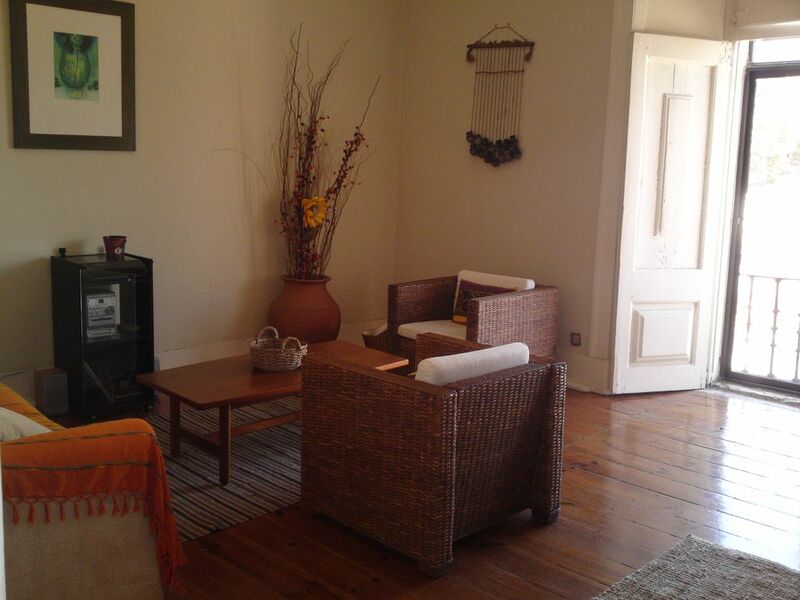 We strongly recommend this property to anyone looking for a place to stay in Lisbon. A wonderful place to stay to explore Lisbon. My family of 5 adults stayed at this lovely apartment for 2 weeks. It is very well located close to the castle and other attractions. from here we were able to visit all the sights and many restaurants in Lisbon. It has a lovely quiet and secluded garden filled with figs, that we had for our breakfast. We were able to spend many evenings sipping wine and the local cherry Brandy at the local view point, a place where others climbed up hill to go, for us a 2 minutes level walk! The views from the main bedroom and lounge were stunning and gave us spectacular sunsets to watch. The tram ( no28), is also a level walk away. This was very useful when after a long days sightseeing we returned home. There are plenty of local cafes and a couple of supermarkets with fresh produce and cakes and pastries to enjoy. Catarina and her family were very helpful during our stay when we needed them. We would recommend Lisbon and its rich culture, as a great place for weekend or like us an extended holiday with time to fully explore all it has to offer. If we ever go back, I would not hesitate to return to this lovely flat. Located right in the historical centre of Lisboa, in the bohemian area of Graca this flat (within a villa so also very quiet) is literally 5 minutes walking distance from Alfama, 3 min from the castle of San Jorge or the famous flea market Feira da Ladra and right next to a variety of outside cafes and the best Lisbon's belvedere (see photos). **Prices are just an approximation and will depend on the length of stay as well as on the number of people staying. £110 is the price basis **Arrival/departure times are assumed to be after 12pm/before 12pm unless otherwise negotiated, and if you arrive during the week but outside normal working times (8am-6pm) please contact us prior to book to assure that we can find someone to be there for your arrival. **Minimum stay 3 days . **Bookings cannot be done with more than 6 months in advance. We apologise for that.